För dig som vill ha det bästa, Chaser-X är en superfin komposit ECE-godkänd hjälm både för bana eller "gatan". För dig som vill ha det bästa, Chaser-X är en superfin komposit ECE-godkänd hjälm både för att köra på bana eller "gatan"
Ventiationen är hämtad ifrån RX-7V och ger ett bra luftflöde i hjälmen. Visirlåsningssystem hämtad från Formel 1-hjälmarna, samma som RX-7V. Chaser-X är den tredje hjälmen från Arai där den nya VAS-teknologin (Variable Axis System) används. - Chaser-X Ventilation: The Chaser-X features an exclusive ventilation system that is unique to this model. It is instantly recognizable by the large intake and exhaust duct on the front part of the helmet. The large inlet allows generous amounts of cool, fresh air to enter the helmet, assisted by the two inlets in the large single frame rear duct. The exhaust function of the large front duct keeps working when the intake is closed. The two small exhaust vents on the back of the helmet help to quickly dispose hot, warm air from the helmets interior. - Outer Shell Construction SFL: Special Fibre Laminate Strict quality controlled construction using special fibre layers, crowded with fibres right to the shell surfaces and bonded with special resins formulated by Arai, to disperse impact energy over the widest possible area – the shell’s main job – through strength, structural integrity and impact flexibility. - Variable Axis System (VAS): With VAS, the visor mounting position is lowered, yielding an average of an additional 24mm across both temple areas, in pursuit of the ideal smoother shape that increases the ability of glancing off energy. As a result, this has made it possible for more of the shell to be smoother along and above the test line of the Snell standard. - Ventilation: Free Flow System (FFS): Creates airflow under the helmet that reduces wind noise and turbulence while increasing the exhaust of hot air. - Front ventilation: Center top vent - intake and exhaust: The new Top Vent provides 11% more airflow than the previous Vent. The new bigger switch makes opening and closing easier. The new Top Vent has three positions; closed, half open and fully open to adjust the airflow and prevent water intrusion when fully closed. - Front Ventilation, Standard brow vents: Fresh air can enter directly to the forehead area without the need for holes in this critical area of the shell and impact absorbing liner. For specific models the ventilation is extended to the temple area. - Front Ventilation, Three position chin vent: Three-position chin vent helps in demisting the visor and offering fresh, cool air to the rider. - Rear Ventilation, Neck exhaust vent: To enhance hot-air extraction from the interior. Increases the ventilation effect at the lower part of the helmet. - Rear Ventilation, One-piece rear exhaust; Extracts more hot air from the helmets interior and improves aerodynamics. - Rear Ventilation, Side exhausts: Produce low pressure behind the rear vent for better hot air extraction. Integrated in the shell for better aerodynamics, reduce wind noise and prevent buffeting at speed. Inside, a small foam dam helps to absorb and diminish excessive noise, without reducing ventilation performance. - Aerodynamics, Fixed Chin Spoiler: Helps minimize wind noise and also aids with the extraction of hot air from the face area. Provides additional deflection of road debris away from neck. Depending on the model the Chin Spoiler is retractable. - Visor, VAS Max Vision Visor with De-Mist option: VAS MAX Vision shield is standard to provide better visibility in all seasons and for all types of riding. Comes standard with Clear anti-fog Pinlock insert to be installed as needed. - Visor, New shield latch system: Borrowed from our F1 helmet, completely modified 3D moving new shield latch mechanism secures the shield like never before, but operates smoothly with an intuitive fluid – one finger operation – even with gloves. - Visor, Pinlock insert lens included: Effectively prevents misting and fogging of the visor, even under extreme wet and damp conditions. May be cleaned and changed easily. - Interior: With the aim of a softer, deeper and even more comfortable fit we developed a new softer liner frame material. The new liner also has adjustable temple padding that allows for a customized fit. - Interior, Replaceable Cheek pads/Ear cups: Depending on the model, cheek pads, ear cups or the complete interior may be easily removed. All parts (replaceable or not) can be cleaned with lukewarm water and mild soap. Rinse well after cleaning and never dry in direct sunlight or near a heat source. Interior parts in different size thickness are available for a custom fit for every rider. - Interior, Replaceable Interior: Depending on the model, cheek pads, ear cups or the complete interior may be easily removed. All parts (replaceable or not) can be cleaned with lukewarm water and mild soap. Rinse well after cleaning and never dry in direct sunlight or near a heat source. Interior parts in different size thickness are available for a custom fit for every rider. - Interior, Speaker pockets: Build in communication systems are popular, but the problem is often that the room for a speaker is limited or just not present, causing unpleasant pressure points. The speaker pockets, offering room for mounting speakers without effecting comfort or fit. (Speaker not included). - Interior, Facial Contour System (FCS): To offer an even better snug fit and enhancing the comfort to the lower jaw, the Facial Contour System (FCS) works with a foam spring support in the cheek pad that compresses and rebounds, providing the necessary support without excessive pressure. - Interior: 5mm ’’Peel Away’’ Ear cups/Cheek pads: Giving even more ability to craft the perfect fit and comfort, the cheek pads now feature a 5 mm peel away layer for added room if needed. - Interior, Thin centre pad for more room in front area: The result is more room around the nose and mouth area enhancing the famous Arai fit and comfort even more. - Approval, ECE 22-05: The most common helmet certification internationally, required by over 50 countries worldwide. - General, Five times inspected: Each Arai helmet goes through five separate quality-control depart­ments: after the shell is made, after painting and graphic completion, after assembly and two in-process inspections. 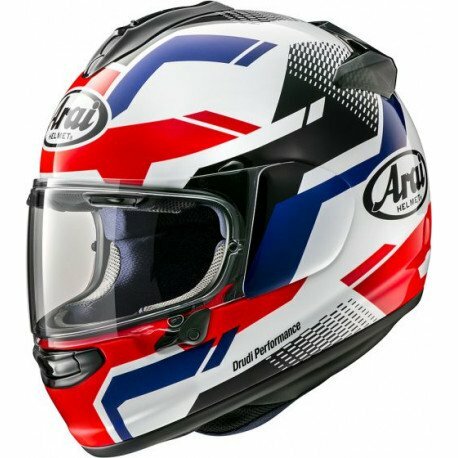 - General, Washable interior: The premium quality interior of any Arai helmet can be easily cleaned, in place, with mild soap and lukewarm water. 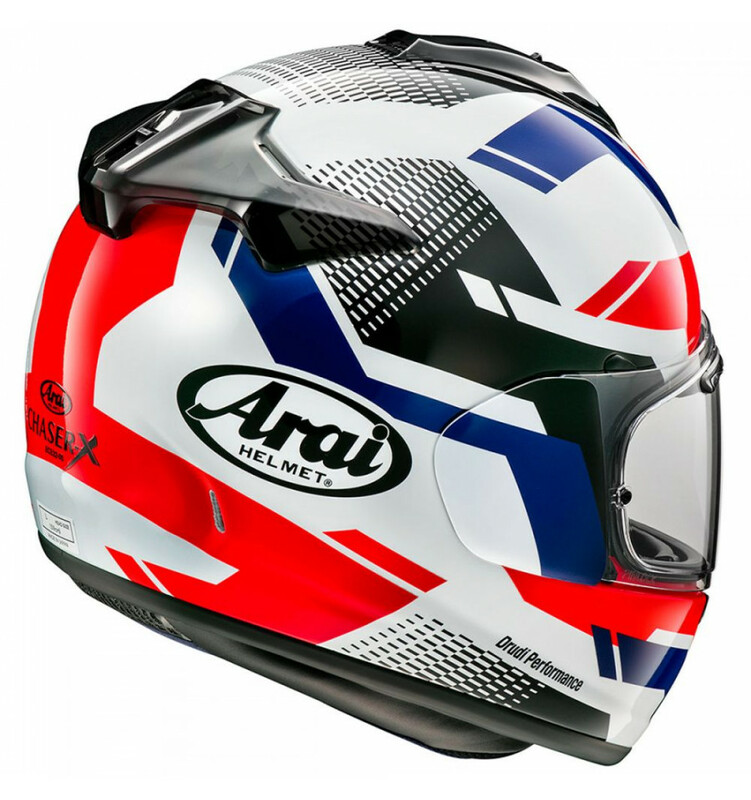 - General, Handmade: It can take up to five years for our experts to earn the right to create an Arai shell. Each shell can take up to 27 steps and to build one Arai helmet will take about 18 man-hours. 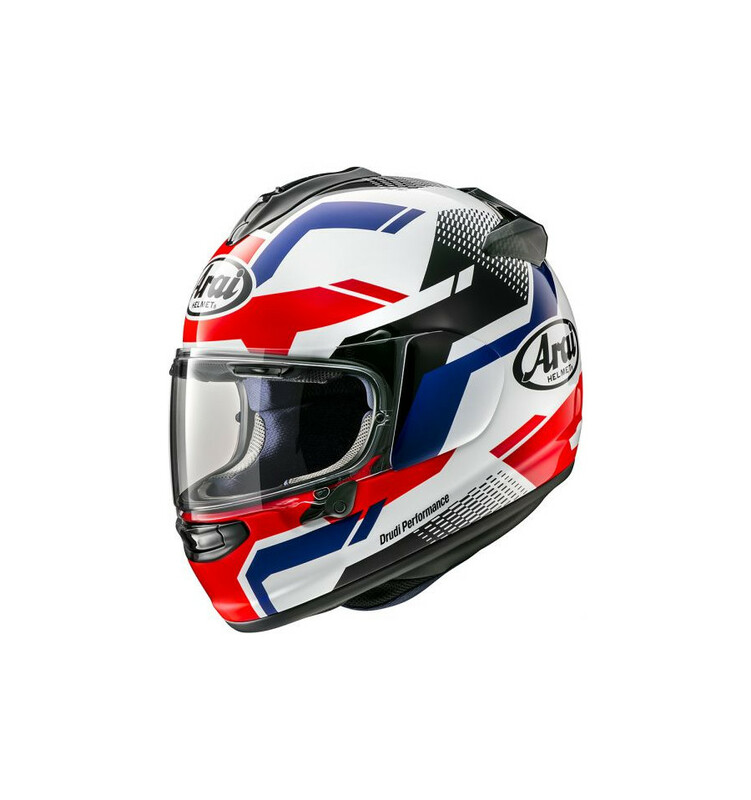 - General, All-day comfort: All-day comfort with the Arai interior fit and shape together with the finest liner materials and the extensive ventilation system. And thanks to the perfect balance and weight distribution of the helmet, you hardly notice you are wearing an Arai. - General, Penetration tested: All Arai helmets are penetration tested, although not required by European helmet standards. The Arai penetration test is performed with a 3kg test cone that strikes from a height of 3m on the helmet. - General, Double-D ring device: The flat and D-shaped rings fit smooth against the chin. No moving parts, no corrosion problems and just pulling the tab is enough to loosen the fastener. - General, Smooth shape, better protection: The smooth outer shell of Arai helmets is designed to glide without unnecessary resistance. You don’t want to decelerate your helmet more than necessary. That’s why all Arai vents and ducts are designed to break off during an impact. - General, Hard outer shell, soft inner shell: Arai uses a very hard outer shell to spread impact forces and a soft inner shell to absorb remaining energy. The multiple-density EPS inner shell is made using a unique technology of combining three to five densities in various areas as a single component. - General, Organic shape: The organic shape of an Arai outer shell offers a more natural appearance, seals better and conforms more to the head’s natural shape for improved comfort, fit and to help minimize wind turbulence. - General, 5-year limited warranty: All Arai helmets are warranted against defects in materials and workmanship, and are serviceable only for the properly fitted first user for 5 years from date of first use, but no more than 7 years from date of manufacture. - General, Different outer shells: Unlike many other manufacturers Arai provides one size outer shell for each two-helmet sizes for most models. Together with different shaped outer shells for different models it is almost impossible not to find the fit you are looking for. - General, Arai In-house test: This Arai helmet is designed to meet the stringent Arai In-house standard requirements, in addition to mandatory standards such as ECE 22-05 and voluntary standards such as SNELL M2010.